In January 2003, utilising Ed Ruscha’s book, Royal Road Test as a readymade set of instructions, Simon Morris and 78 of his students cut out every work from Sigmund Freud’s 736 page book The Interpretation of Dreams (including the index – 333,960 words). Simon Morris subjected Freud’s text to an ‘aleatory moment’ – a seemingly random act of utter madness – by throwing the individually cut out of the window of a Renault Clio travelling at 90 mph on Redbridge Road, Crossways, Dorset. The location was 122 miles southwest of Freud’s couch. The action freed the words from the structural unity of Freud’s text as it subjected them to a random act of utter madness. The exhibition approaches this aleatory moment on three levels: firstly, it contains the detritus of the process of documentations. Secondly, it collects together the responses of some of the collaborators and other artists who have been associated with the project. Thirdly, and most problematically, it tries to return to something of the aleatory moment itself. The exhibition at the Freud Museum contained the photographs, films and words of Morris’ experiment on Freud’s writing, and works by others associated with the project. The Royal Road to the Unconscious is a complex and large scale work consisting of several stages and a range of collaborators. For Morris collaboration is an extremely important part of his methodology whereby he experiments creatively by having his work constructed by others. Morris draws on the commonly referenced Buddhist concept that the self has to be erased to achieve a pure state of creativity (see his book ‘spinning: decentering the self’ by Howard Britton and Simon Morris). In order to create, the artist must be effaced by the moment of production. The book and the photographic exhibition are the product of Morris’s collaboration with Howard Britton, Pavel Bücher, Maurizio Cogliandro, Daniel Jackson and Dallas Seitz. The action was filmed by Daniel Jackson, and photographed by Maurizio Cogliandro and Dallas Seitz. 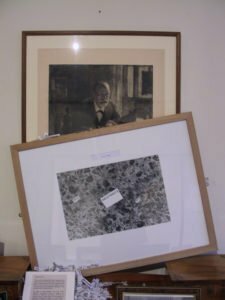 Under the direction of the psychoanalyst Dr Howard Britton (curator) the text was photographed as it had fallen. The photographic documentation was then made into a book based on Ruscha’s Royal Road Test and undesigned by Pavel Büchler. The basis of Freud’s work is his own and his patient’s dreams. Seitz has collected over 100 dream objects that occur in the accounts of these dreams. All the objects were identified by Seitz and contributed by individuals approached by him – including his grandmother’s dentures. On one wall Jackson has used his Extraction programme to randomly remove every single word from The Interpretation of Dreams. On another wall in a specifically constructed computer LCD unit and acting as a foil, two circles are in conversation. Two prints function to ‘explain’ these works. As with much of McDowall’s work his text of eight words evokes an elsewhere. Yet this evocation of nothingness is never arbitrary and is linked to a series of specific and multiple referents, in this case starting with the words, eulogy, moment and was, and like a rebus revealing a process of other meanings, other places (Japan, California and Paris) which connect and diverge. 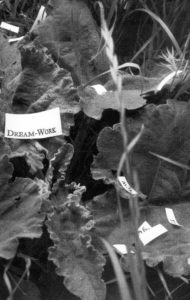 Worthington’s selection of one colour and three black and white photographs from his work in progress Tipster’s Selection intersects with the project at the level of a latent as opposed to manifest content, since it has little to do with Freud or The Interpretation of Dreams. This provokes a need to find relationships between the two works at a level of chance, and the random, as well as the way that people’s dreams are the real stakes of the bookmaker. Phillpot’s contribution acts as a bridge between the Ruscha work in 1966 and its contemporary manifestation in The Royal Road to the Unconscious. Slightly enigmatically, Ruscha himself suggested in relation to the Royal Road Test that Morris’s work shows that ‘it’s time has come’. In Phillpot’s playful text there is an acknowledgment of the ‘beyond of meaning’ that unites both projects, and the insistence with which the need to go beyond emerges at certain places and certain times. In 1966, Ed Ruscha (Driver), Mason Williams (Thrower) and Patrick Blackwell (Photographer) drove 122 miles Southwest of Las Vegas, Nevada in a 1963 Buick Le Sabre. The desolate area is known as ‘The Devil’s Playground’. They were travelling along U.S. Highway 91 at a speed of 90 m.p.h. when the writer Mason Williams threw a Royal (Model “X”) Typewriter out of the window. The weather was perfect. The time was 5:07 P.M. Patrick Blackwell, the photographer then documented the scene of the strewn wreckage. The documentation of the performance was subsequently bound into a book, Royal Road Test.